Tallulah Bankhead is buried in the cemetery of St Paul's Church in Chestertown, famous for its 360 year old Oak tree. Visitors to her grave site like to cite outrageous quotes like, "Cocaine isn't habit forming. I should know--I've been using it for years." Down the road from Chestertown in Rock Hall don't miss the Waterman's Museum. It's really little more than a musty shack on the harbor, but it's filled with treasures, amongst them an anchor made by Captain Dan Ayers c l920, an antique sexton, a model of the trawler T.H. Anderson II (now lying at the bottom of a cove off Tilghman Island).You can read about "pound nets" and catfish pots and gaze at a wooden sculpture of a Great Blue Heron. Under the rubric of "General Comment," you will find the following advice: "The watermen of Chesapeake Bay are very proud of what they do and how they do it. They have a love of the outdoors and they jealously guard their independent lifestyle. Each new dawn brings with it a certain amount of freedom to choose whether to fish that day and in what way to harvest the bounty of the water." From Rock Hall journey out to the Eastern Neck National Wildlife Refuge which rests on a peninsula teeming with all kinds of birds and waterfowl and if you take Bogles Point Landing Road, you will come to the historic site of one of the great l9th century steamboat stops. 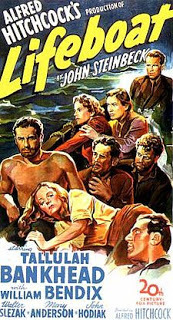 Now shipping takes place in other corridors and the landing is populated by a smattering of locals with fishing rods who cast from the dock--most of whom are probably too young to remember Tallulah Bankhead's brilliant role in Hitchcock's seaworthy Lifeboat.